Today i would like to talk some about the Victorinox steel. On the picture you can see three blades, one is a Morakniv and the other is the two blades you find on the 91mm Victorinox knives. If you learn to use a Swiss Army Knife in the traditional category or 91mm then you learn proper knife use and if you are looking for a harder use knife then you must go up in the size and category. These should have a lock. 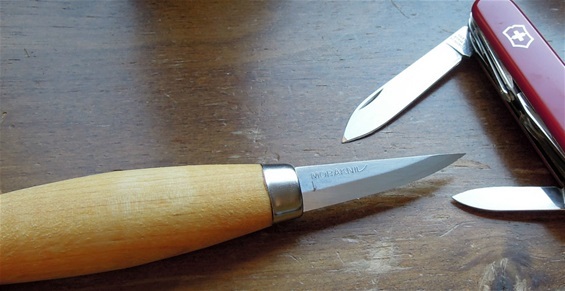 The traditional pen blades and slip joint knives actually got a community of users when it comes to wood-carving tasks. The steel is actually developed to have a bite and this you can notice on most Victorinox knives. The steel bites in wood and that is not just because of the design it is because of the steel type used. It may sound weird for many that a stainless steel that is 56HRC and is so slim could even hold an edge enough for wood-carving. It does hold an edge fairly well and most wood cutting does not involve much force. The slim blades are used for precision cutting and that is what much wood-carving is all about. Some prefer softer steel that need to be sharpened on a regular basis because proper knife use involves the edge sharp all the time. The Mora knife is a harder laminated carbon steel that is an excellent tool for wood-carving. It gives much for the money without any doubt. The combination of these three blades represents precision tools. The Victorinox blades are very slim and can be used for the finest precision work. I have used knives when I make knife handles and the cutting got different stages and at first large pieces of wood are removed, then smaller pieces until the last very small pieces together. Shaping also got stages and the final before file or sandpaper is to even things out.